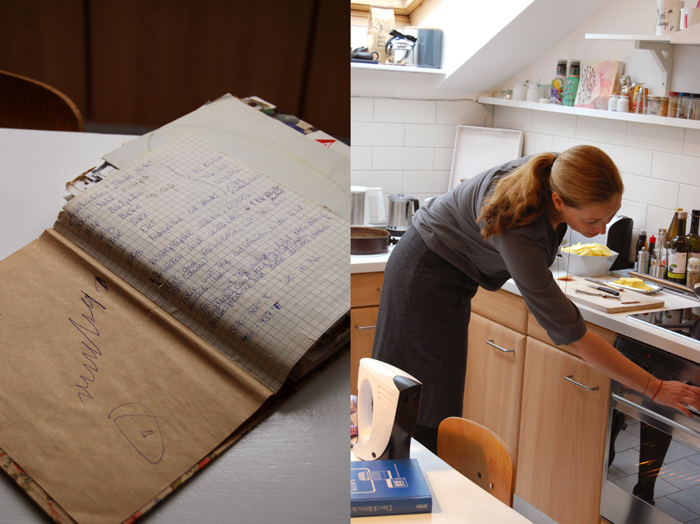 When I met Imke in her kitchen on a cold and dark Berlin morning, it started snowing. It was the first snow of the winter (and the last so far) and I couldn’t have found myself at a warmer and more comfortable place than her stunning roof top apartment. The interior designer created a beautiful world for her family of four in shades of white and light grey, with lots of light, cushions, candles and cosy corners. Her open kitchen, living and dining room is the place where you want to sit with a cup of tea and chat for hours. I can imagine that the long table, the centrepiece of the room, has already seen many special nights of feasting. Imke created the perfect place to gather and savor, to feel at home as a guest and enjoy. 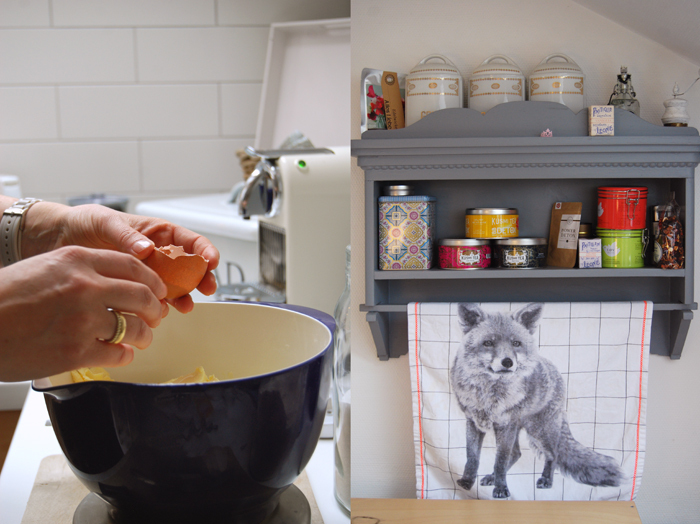 My kitchen host is a fascinating woman who I met not too long ago but there was something in her eyes that made me want to find out more about her. Imke is a renowned interior designer, her clients appreciate her sensitivity, confidence and style. She understands and respects their needs and creates spaces that make you feel good. Not a single chair, sofa, table or lamp is pretentious, it all makes sense and is a functioning part of her daily life. But it also pleases the eye, it just seems very effortless. Imke found her present profession over the past few years. She studied law and worked as a lawyer for a photo agency in Hamburg but then moved to California together with her husband just after their first child was born. In the new country she decided to make another change in her life, she studied design at the New York Institute of Art and Design. She successfully finished her correspondence course and her first projects began. After the family moved back to Berlin a few years later, it wasn’t long before she established herself in a new situation again. From the start, the demand for her stylistic advice, help and guidance was just as high on this side of the world. This summer the family bought a little weekend house at a river outside Berlin which they are renovating themselves. A new project for Imke, her husband and their two 13 and 7 year old daughters, lots of building and painting but also picnics and looking for mushrooms in the countryside. When the four need a break, they love to travel without planning much to see where life takes them, a 3 week trip to India is next on their list! Imke’s eyes sparkled when we talked about this adventure and when I asked her about the difficulties of traveling with two young girls, she didn’t seem too worried. The effortlessness which fascinated me from the start is built on trust and a positive attitude. 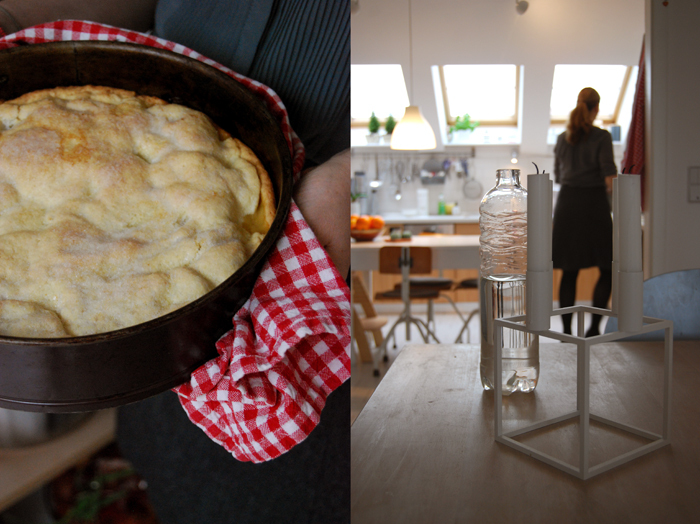 That’s also what Imke prooved when we started our kitchen session. She couldn’t find the apples which she hid from her family for the pie she wanted to bake with me. 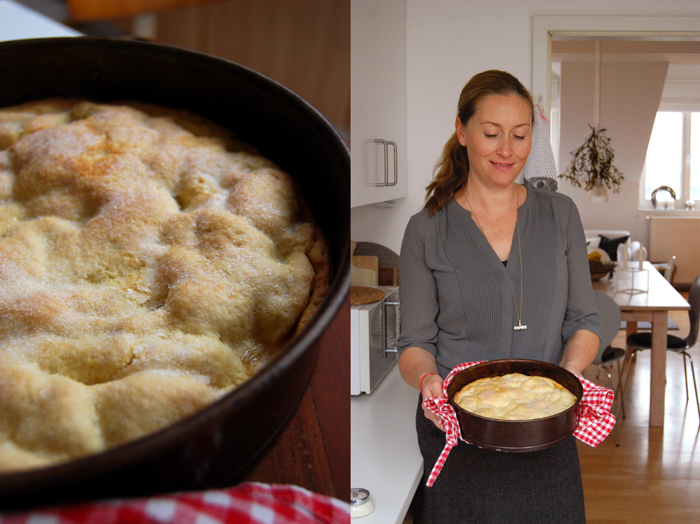 Her aunt Herta’s Apple Pie (gedeckter Apfelkuchen in German) is an old family recipe which needs lots of sour fruits so she bought a big bag full but couldn’t find them. I offered to run to the grocery story but Imke stayed calm and was sure that they must be somewhere. She was right and we could start. As if life wanted to test her patience, a second obstacle came into our way. The oven broke and refused to keep the right temperature. Imke kept her cool, sat right next to the oven, put it on the highest temperature and kept an eye on our pie. 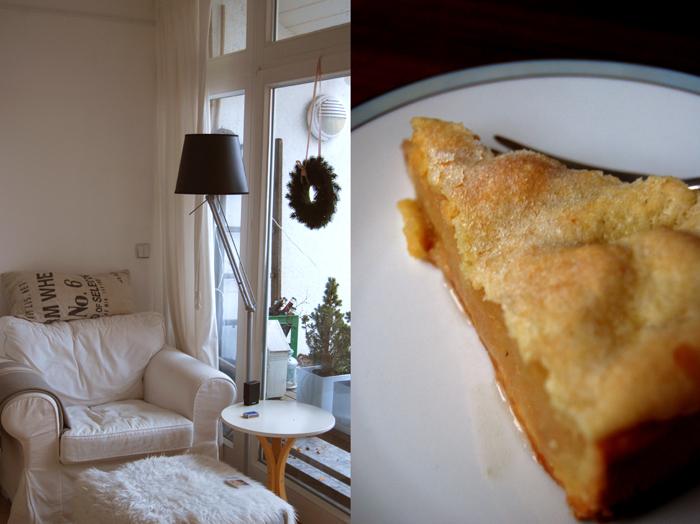 It all worked fine in the end, the pie was fantastic, packed with lots of juicy apples and a crisp thin pastry. 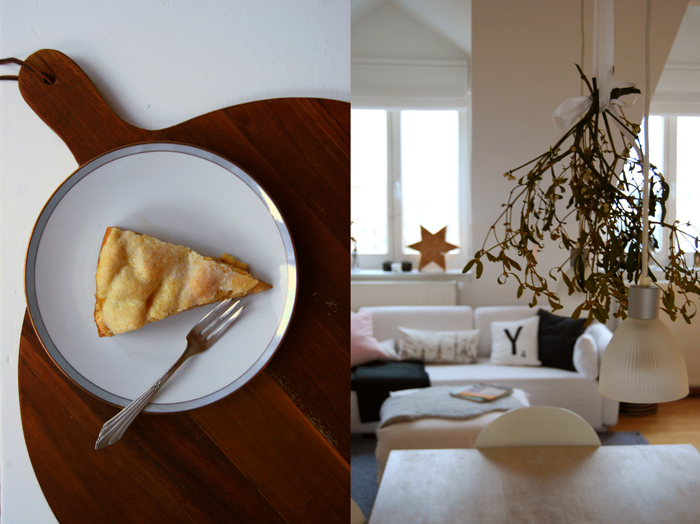 On my way home I noticed that this lady, her pie and her gorgeous apartment left me with a really good feeling, life is good when you trust! 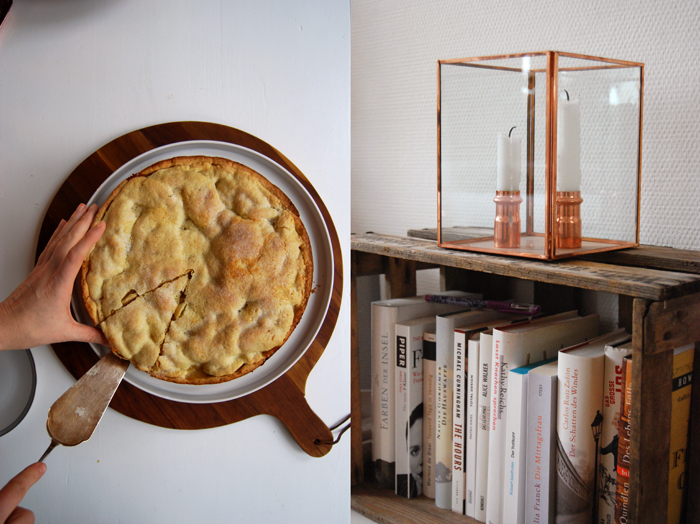 You can see Imke’s work her on Laux Interiors and follow the progress of her country house on her new blog Laux Haus. Mix the flour, baking powder, sugar, salt, eggs and butter with an electric mixer until well combined. Form the dough into a ball and keep in the fridge for at least 1 hour. Set the oven to 210°C / 410°F (fan-assisted oven) or 225°C / 440°F (top / bottom heat). In a large pan, cook the apples and vanilla sugar for a few minutes until soft and let them cool for a few minutes. Roll out 1/3 of the dough between cling film until it’s roughly the size of the springform pan. Roll out the remaining dough between cling film and line the bottom and the sides of the springform pan. Fill the apples into the dough-lined springform pan, even them out and put the remaining pastry on top. Close the pie and spread around 1 tablespoon of butter (in small pieces) and 1 tablespoon of sugar over the top. Bake for 20-30 minutes or until golden brown and crisp on top. You lived in California for seven years with your husband and two daughters before you decided to make Berlin your new home. How did your lifestyle change through this move? We moved from a big house with a garden in the suburbs in California to an apartment on the 5th floor in downtown Berlin. What changed drastically is the convenience of our daily life. Grocery shopping for example is a whole different story when you don’t have parking on the same level as your kitchen. I go grocery shopping more often now and buy smaller amounts of food because I have to carry it up the stairs to the 5th floor. We also spent much more time outside in California. We used to go to the beach almost every weekend or went hiking in one of the great State parks. Now in Berlin we are far away from the coast or the mountains but we love to bike around the city or go swimming in a lake in the summer. How did the new city influence your cooking and eating habits? In Berlin we have a ton of great restaurants in walking distance. So we definitely go out to eat way more here than in the States. My cooking hasn’t changed much I believe. What did you miss about German food when you lived in the US? 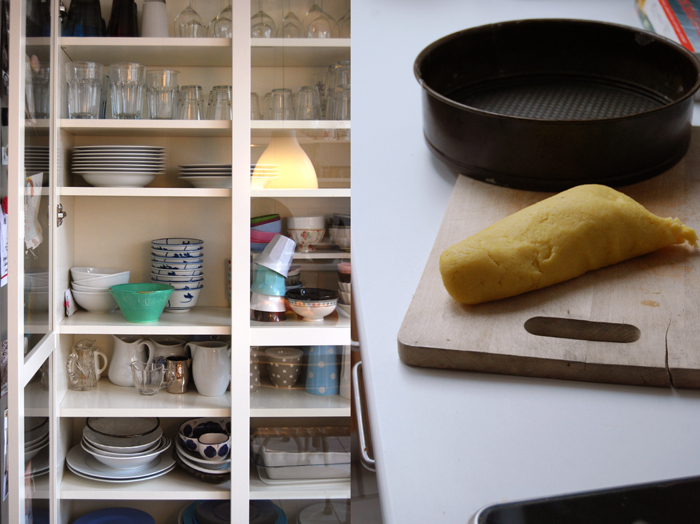 Did you adapt to any American kitchen habits that you miss since you’ve been back in Germany? I missed the German bread! The American bread is way too soft and sweet. So I baked our own bread in the USA. Here in Germany you find a bakery at every street corner with a big selection of whole grain breads and rolls – so we eat more bread here. In Germany I miss being able to buy freshly baked cupcakes in the supermarket. That was so convenient. The table ready (pre-washed and pre-cut) vegetable and salad selection in the States is amazing. Also there are some really good ready made organic dressings. I loved grocery shopping at Whole Foods or Trader Joe’s. I really miss that. Everything looked so nice and you could always sample things. You told me that you enjoy baking more than cooking, who or what sparked your love for sweet creations? I enjoy baking more but I still cook more than I bake, because I have to cook dinner almost every night. I bake just occasionally. 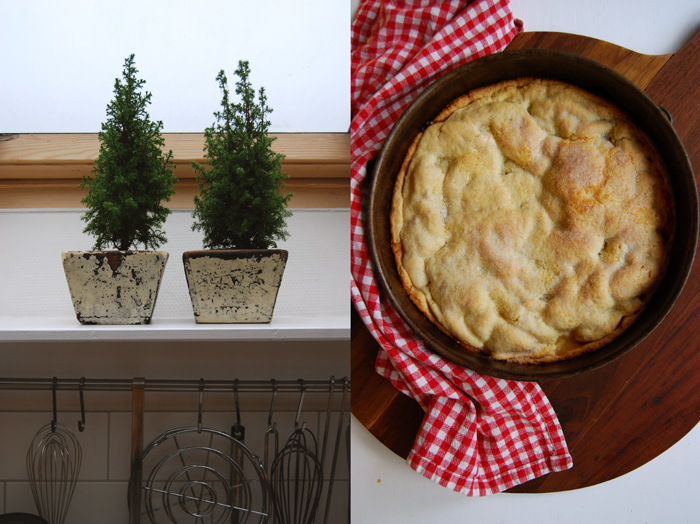 I think baking is more fun for me because I really like to eat cakes, pies and cookies. I am a big fan of sweets. I love the smell of freshly baked goods in the house. My mother and my aunt are to blame. They bake amazing things! I baked a pie for my mother as a surprise. I think I was 8 or 9 years old and I forgot to add the butter to the dough. So what came out of the oven was solid as a rock. But we still ate it and my mother pretended that she loved it. I love to go grocery shopping at the farmers markets – the organic food market at Kollwitzplatz on Thursday afternoon and the weekly farmers market on Saturdays. I buy fresh pesto, cold cuts and cheese at the Italian Deli Giannis Pasta-Bar on Schönhauser Allee. I love the bread selection at Zeit für Brot on Alte Schönhauser Strasse. I am a also member of the organic supermarket LPG Biomarkt at Senefelder Platz. My favorite supermarket is Kaiser’s at Winsstrasse. They have everything. My favorite café is the Meierei on Kollwitzstrasse, they serve great coffee and have a small selection of sweet or savory dishes. Restaurants that we like to go to are Aromi e Sapori on Straßburger Strasse, Leibhaftig on Metzer Strasse, Due Forni and Fleischerei on Schönhauser Allee, Lemon Grass Scent, Donath and Pappa e Ciccia on Schwedter Strasse. You worked as a lawyer for a photo agency in Hamburg and couldn’t follow your profession when you moved to California. How did you come up with the idea to start something completely new, your own design company Laux Interiors? I always had an interest in interior design. 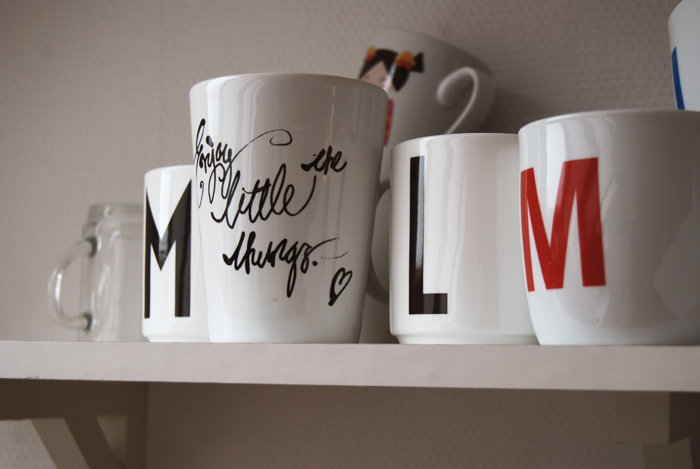 I was the one friends would turn to for advice when rearranging their home. I had the constant urge to move furniture around in our home. When we moved to the States I was surprised to learn that interior design was/ is such a big thing over there. There are entire TV channels dedicated to it. So I decided to turn my passion into a profession and went back to school – this time for interior design. Your father is a goldsmith and your mother was a home economics teacher and is now a full time artist. How did your parents influence your aesthetic perception and your creative work? My parents always took me to museums, exhibitions and galleries. Growing up my father had his own gallery where he would exhibit his own jewellery along with paintings and sculptures of other artists. His aesthetics in jewellery design are very clean, elegant with flawless craftmanship. My mother is very expressive, caring and has a big heart. Her art is colourful and earthy. Sometimes I feel that I am torn between these two aesthetics. This summer you bought a little weekend house built in 1974 at the picturesque Oder-Havel canal and you write about the progress of the renovations on your new blog LauxHaus. What is the biggest challenge and what is the great gift of renovating something old rather than buying new? The biggest challenge for me is to be patient. I would love to do it all at once. But we are only there on the weekends, so it takes time to finish something. The huge garden also is something that scares me a little. Actually I would have loved to built a brand new house – something energy efficient with green materials and tons of glass – but the house is located in a protected nature reserve so we can only preserve the status quo but not build anything new there. We bought it mainly because we love the location at the riverside so much. In really old buildings that I often have to renovate here in Berlin for clients I adore the craftmanship that you find in elements like stucco, panelling, doors, windows, floors, glass and hardware. You don’t see this anymore in homes that were built after World War II. 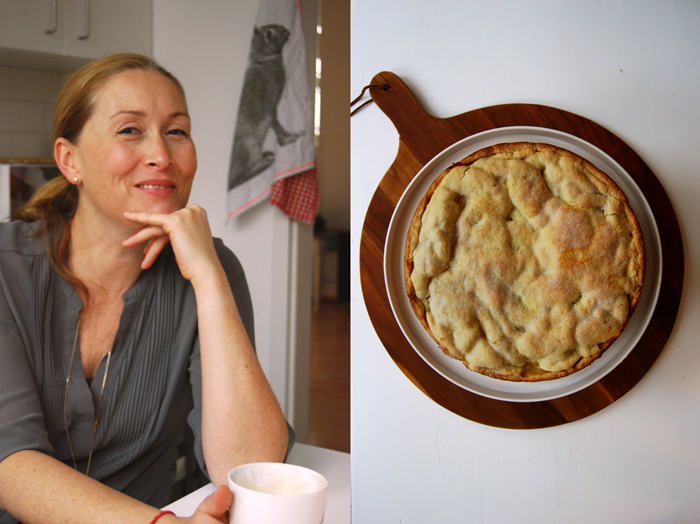 I chose to share an old family recipe with you – Apple Pie Aunt Herta. It’s a classic for decades. This pie is a staple at every birthday or special occasion in my family. The recipe was given to us from my great aunt Herta, my grandfather ‘s sister. I thought I’d share it with you because I always get positive feedback for this pie. I love that the crust is so crispy and the apples are so juicy and still a bit sour. It would be a tie between my grandmothers Wilma and Resi. Wilma would have to show me how to preserve apples and pears from the garden by cooking them in jars with cinnamon sticks. Resi would have to show me how to cook East Frisian Sniertjebraa, a slow cooked pork roast. Roasted pork loin with oven roasted vegetables and rosemary potatoes. If it’s really short notice – pasta with pesto Genovese and salad. My favorite as a child was Paprikagemüse – a dish in a pan with ground meat, red and green bell peppers and tomatoes served with rice. Now I could eat tagliatelle with truffles and parmesan cheese every day. Or Sushi. Together with others. It’s more fun when you can chat and have a glass of wine while cooking. Although I am more focused and quicker when I cook alone. I mostly improvise a little – probably I would be calmer and less stressed if I planned ahead.